Muscle unloading causes muscle function deterioration, but the extent to which training frequency or volume can be reduced while preserving muscle function during muscle unloading is unknown. We examined the effects of low-volume muscle endurance and strength training on forearm muscle oxidative capacity, endurance, and strength during a 3-week immobilization. Twenty-seven, healthy, male volunteers were divided into four groups: immobilization only (IMM); immobilization with endurance and strength training, once-weekly (IMM + EST1) or twice-weekly (IMM + EST2); and control, without immobilization or training (CNT). Endurance training involved dynamic handgrip exercise, at 30 % of maximal voluntary contraction (MVC), until exhaustion (~60 s). Strength training involved intermittent isometric handgrip exercise at 70 % MVC (40 s). Muscle oxidative capacity was evaluated after exercise using the phosphocreatine recovery time constant using 31phosphorus magnetic resonance spectroscopy. 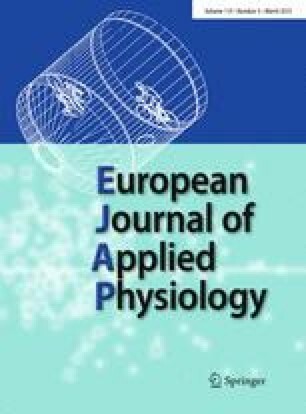 Endurance performance was evaluated according to the total work during dynamic handgrip exercise at 30 % MVC at 1 Hz until exhaustion. Muscle oxidative capacity and total work deterioration was restricted to the IMM (P < 0.05) group. MVC decreased in the IMM and IMM + EST1 (P < 0.05) groups. However, the MVC amplitude decrease in the IMM + EST1 group was smaller than that in the IMM (P < 0.05) group. MVC remained unchanged in the other groups. During the 3-week immobilization, twice-weekly low-volume muscle endurance and strength training prevented deterioration in muscle strength, oxidative capacity, and endurance performance. Moreover, once-weekly muscle endurance and strength training prevented the deterioration of muscle oxidative capacity and endurance performance, and attenuated the degree of muscle strength decline. The authors wish to acknowledge the volunteers who participated in this study. We also thank the entire staff of Tokyo Medical University’s Department of Sports Medicine for Health Promotion for their helpful advice and technical assistance. This work was supported, in part, by the National Space Development Agency of Japan and a grant-in-aid from the Japanese Ministry of Education, Science, Sports, and Culture.